Check it out! Isn't it so much fun? 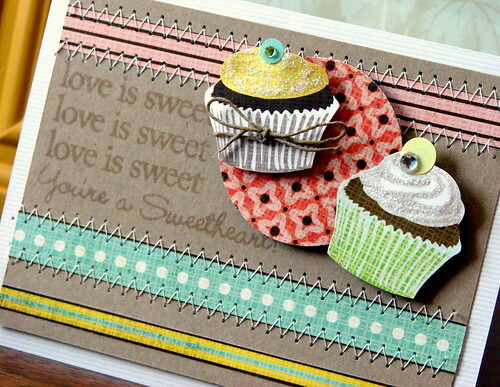 All the patterned papers are double sided and are from October Afternoon's Farm Fresh Collection. 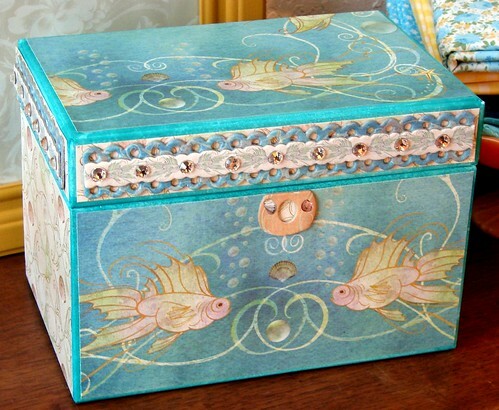 When this box of goodies arrived on my doorstep last week I was thrilled and started creating immediately with it. I can't wait to share my creations with you soon when the Mosh Posh Gallery goes live! Until then, why not hop on over and sign up to get your own "field trip" reserved! I have a feeling they are going to go fast just like last month's kit! Zoey and I went to the library after school today to return our huge bag of books and dvd's and to pick up the newest Junie B. Jones series of stories on CD. She is obsessed with the little girl Junie B. Jones and all of her crazy happenings...and I have to admit that they are pretty fun stories and the adventures that she finds herself in are very easily adventures that any five year old could relate to. =) In addition to today's Junie B. Jones score we picked up a newer book that I had read about on amazon.com that seemed like it would be fun and I am happy to report that it is easily going to be one of our new favorites now for sure. All Kinds of Families by Mary Ann Hoberman is a very sweet story about how all sorts of things can be families...people, animals and buttons or spoons. It talks about how when you were born you made your mom a mom and your dad a dad...a grandma your grandma and so on...in this part of the story Zoey interrupted me and asked, "I made you a mom?" And when I said yes, she was simply amazed and a lot a bit proud. It was really neat and probably something that kids really don't think about. What struck me perhaps the most though were the illustrations. They are simply amazing. You could easily spend five minutes on each page just looking at all the fun little bits that are included here and there throughout the book. The illustrator is Marc Boutamant, check out his amazingly fun gallery of work here. Yesterday was a day like any other until I went to pick Zoey up from school. Parents who come to pick up their children usually wait in the cafeteria and the teacher will bring the students through by class and those with parents there will be dropped off with the parent and then those students that ride the bus are then taken around to the back of the school where bus pick-up is. Yesterday Zoey was noticeably glum when walking towards me and while her classmates were following their teacher to the bus pick-up area Zoey's best little buddy from her class looked at me urgently and said that she might be moving away...her eyes were so pleading it was as if she was wanting me to do something and to do something now. My heart just fell and I turned to Zoey who simply burst into full out sobs. It was the most helpless that I've felt I think since becoming a mama. 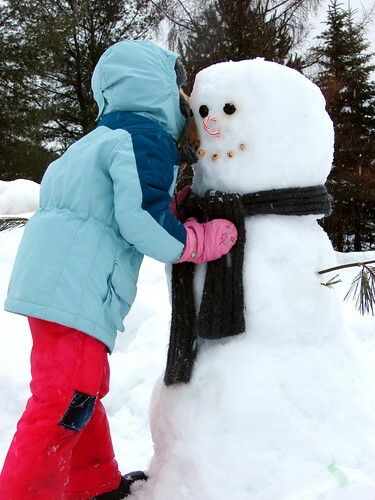 We went out to the car and she was still sobbing, she cried all the way home and once home we sat on the floor and hugged, she still in her snow pants and coat, hat and mittens. This little friend has been such a special gift. I remember being so nervous about Zoey starting Kindergarten because she knew none of the girls that were going to be in her class at this new school and on that very first day this little girl with snow white skin and hair to match just stepped in to being that little special person that would be Zoey's little anchor. She and Zoey are the only two girls in her class that believe in fairies, they are perfectly fine with walking around the playground singing songs for an entire recess, they have a little game where they each guess what the other is going to be wearing when they arrive to school each day (they guess before taking off coats and snow pants), they have special little patterns of eating hot and cold lunch and follow it to a 'T' (this has threatened to drive me insane at times!) ...this is the first friend that Zoey has said sorry to without having a grown up suggesting that that happen. 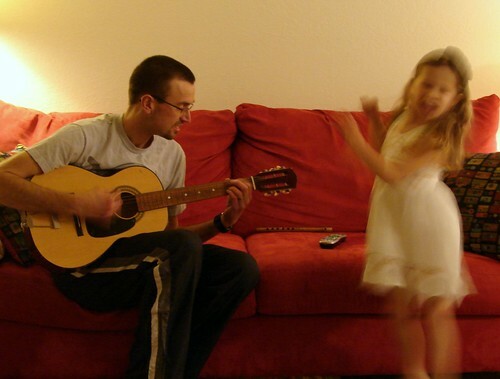 I hope that it turns out that this little girl doesn't move away, or that the move is just to another area school at least so that Zoey can still perhaps get to see her around once in awhile and have play dates with her. If she does in fact move I promised Zoey that we would get some special note cards and envelopes with postage stamps to give as a gift to her friend so that they could write to one another. I know that there are many more things that are plenty worse off that we could be dealing with but this was just one of those little unexpected heartaches that we'll just have to get through. The first of many I am sure. It still doesn't make it easy. just playing around with some scraps from my January Mosh Posh kit. 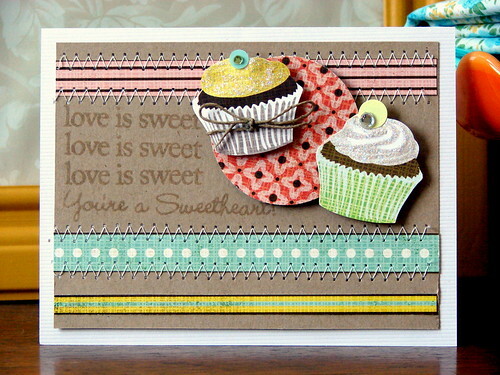 Loving those little cupcakes from one of the patterned papers from Basic Grey's Nook & Pantry collection. 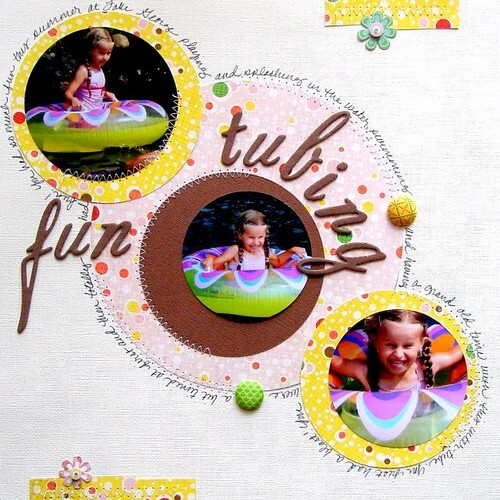 They are so fun to make your own embellishments with! I added a bit of Stickles (glitter glue) to the cupcakes for a little extra something special. 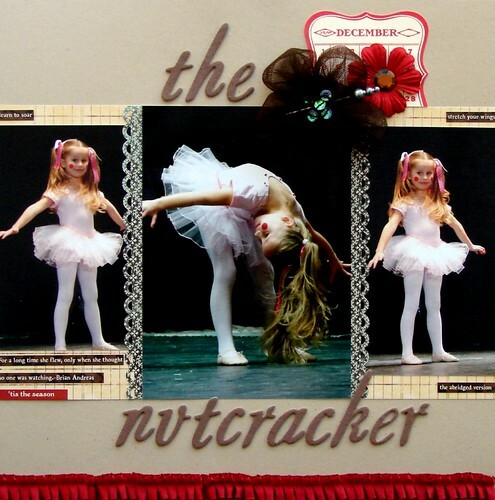 I got the kit that will be February's kit and it's adorable! You're going to think it's "mooooooo"valous! (That's a little bit of a hint for you)! I've already got a layout done using it so you know that I love it! I came across this video and was reminded just exactly of the "why" it is that I started in doing this thing called scrapbooking. And it made me go digging through some of my older pages...here are some from back when I first started scrapping. I've come a long ways don't you think? I thought it was kind of funny how most of my early pages are all two-pagers yet have almost no journaling! And my decorative edged scissors sure did get used back then! =) Even though they are obviously dated by the papers and old school embellishments and my design capabilities, I wouldn't change a thing about them. It's where all this started after all! Thanks for going down memory lane with me! And there was! 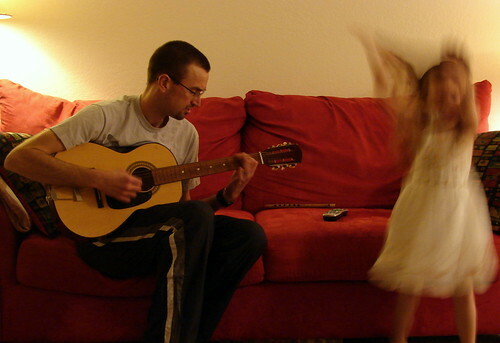 One of Ethan's co-workers gave him an old guitar today...Ethan played guitar when we first met in college. This is a happy little home tonight! 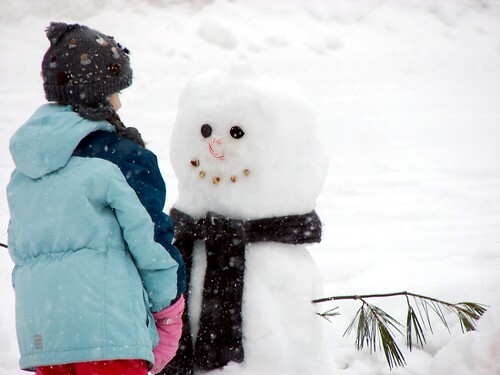 I love the picture above and how it looks like she's in deep conversation with her new little friend. 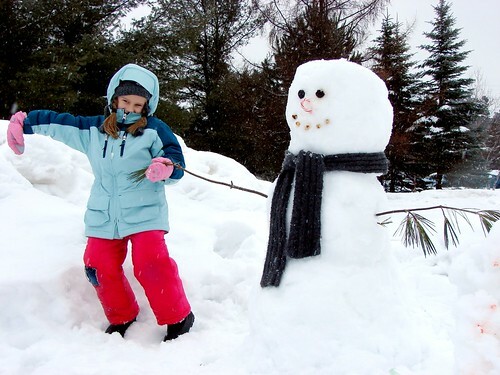 Do you see the little patch on her snowpants? 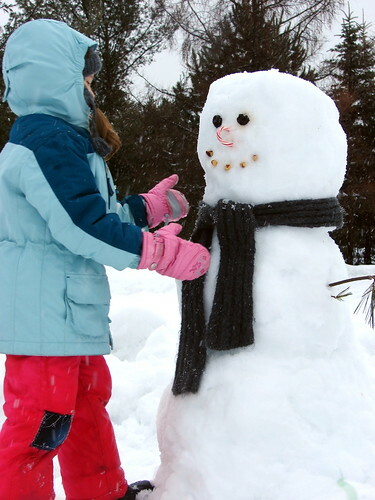 At school the kids slide over and over on a little hill at recess and they are always on their knees...hence the blown out knee...(sigh). At least I know she's having fun playing! 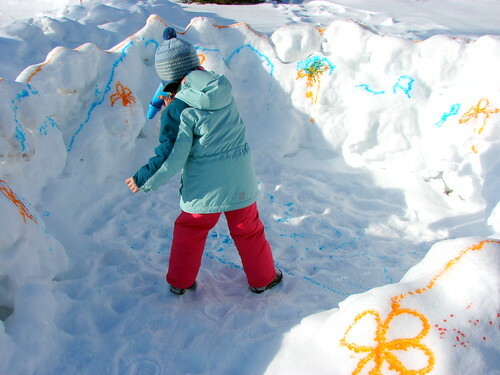 We went out for lunch today with some new friends and really enjoyed ourselves and then came home to spend the afternoon outside playing in the snow. 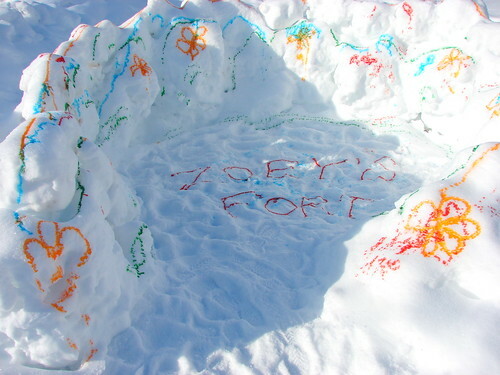 When Zoey and I came in we were completely soaked as it was the super heavy and wet snow. This evening Zoey and I practiced passing the basketball (something they are doing in gym that she wants to feel more confident at) and of course football was on (have to say I'm glad that the Saints beat the Vikings!). 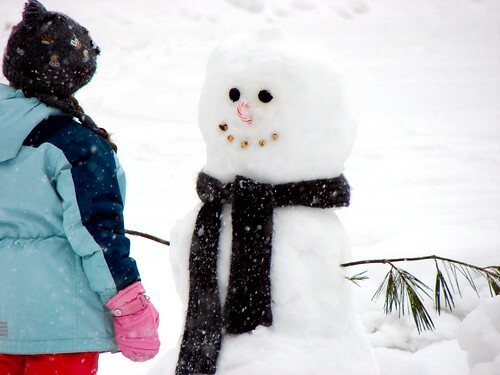 A wonderful snowy Sunday and the perfect end to the weekend! The other day while in a department store I picked up a plastic container of some foam adhesive backed hearts (similar to these) that were in various different sizes and colors thinking it would be a fun little surprise for Zoey and that we'd figure something out to do with them eventually. Well, today was an early release day from school for Zoey so we tackled the project head on after lunch and came up with these adorable (and easy to make!!) 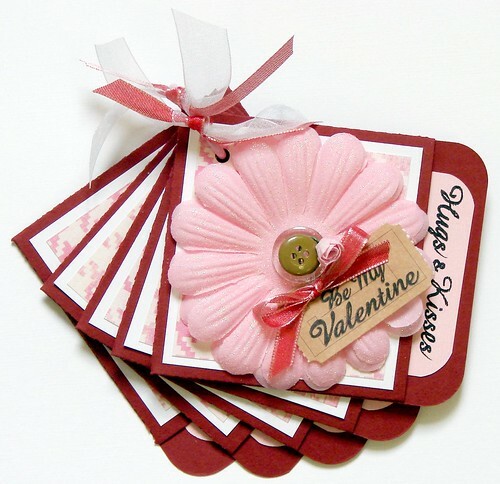 Valentine Clothespin Clippies that she will be giving away to her classmates for Valentine's Day this year. We're going to clip her valentine cards in the clothespin and write, "[Child's name], I'm stuck on you!" because they are magnets...hee..hee! I was thrilled when I came up with this little phrase, though after sharing my idea with Ethan I am now sure that this isn't an entirely new concept...at the time though I thought I was simply brilliant! 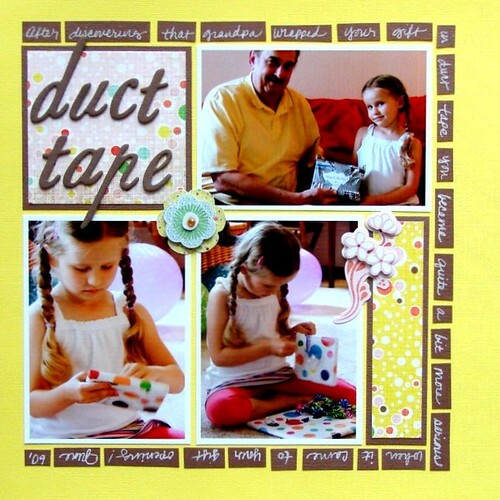 =) I do have to thank my friend Genea for pointing me in the direction of this post by Homebased Mom. 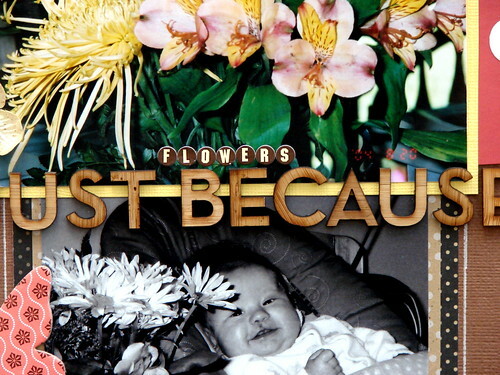 It definitely got me thinking in the right direction for this project! 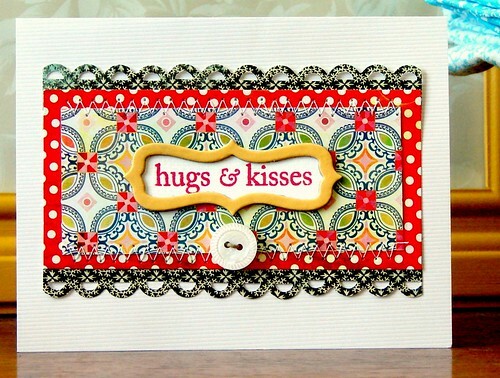 Put adhesive on one side of your clothespin and put face down on your patterned paper (wrong side up) and cut out with your craft knife. 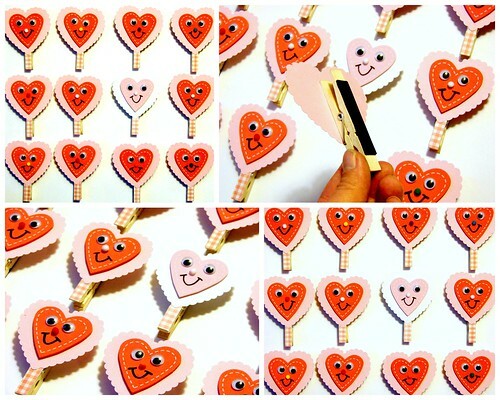 Decorate your foam heart faces with googly eyes, mini cotton craft balls and permanent marker. Punch out scalloped hearts and adhere your foam hearts to the scalloped hearts. Apply a bit of adhesive to the top portion of your clothespin and adhere your heart to the clothespin. Cut your magnetic strip to size and attach to the back of your clothespin. 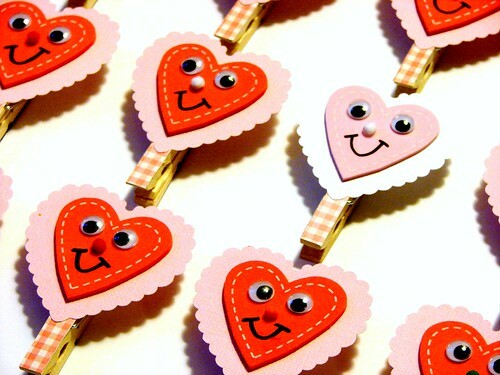 Now have fun writing out your valentine's and clip them in your special one-of-a-kind Valentine Clothespin Clippie Magnet! 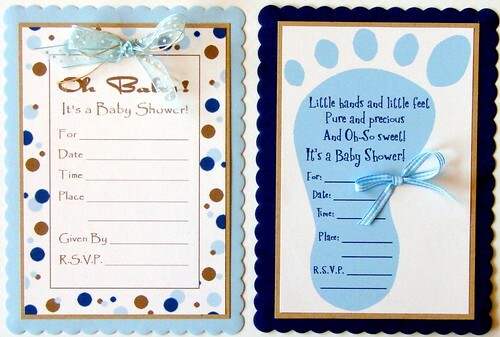 and one using baby pics nonetheless! 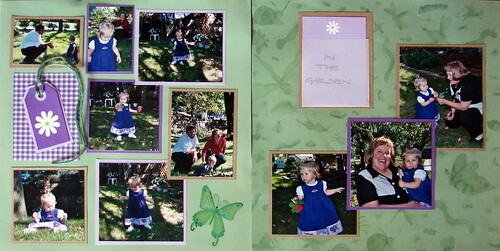 I obviously have no problem with scrapbooking photos in no order whatsoever! In fact, I love the no pressure feeling of just creating pages with whatever photos I want, whenever. It's also pretty fun to go back and look through all these little sweet photos of Zoey when she was just a little babe. Look at those cheeks! I just want to give them kisses! This is a pretty simple design, wanted the focus again to be on the photos. I have to say that I am loving those wooden letters by Making Memories! I got them at my local scrapbook store, Paper Studio and am thinking I may have to get some more because I love them so much! Here's a simple and quick card that I created using some of the patterned papers from my 6 x 6 June Bug stack of paper that's from Basic Grey. 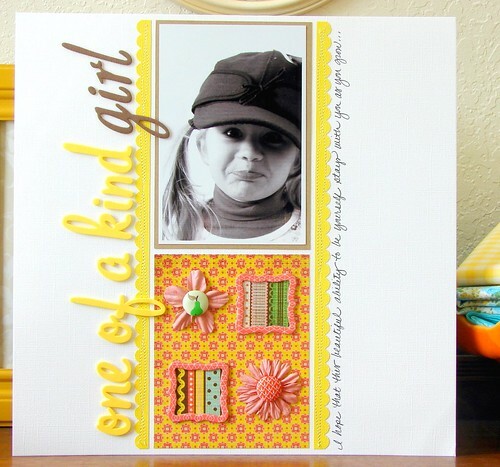 The stamp is by Hero Arts and the chipboard frame is by American Crafts. Love how vibrant and bright these papers are! Read this post today and was inspired to share. To learn more please read through previous linked post on the Craft Hope site. They are currently looking for craft donations of all kinds to sell and all proceeds from the sale of the crafts will benefit Doctors Without Borders. I'm having a bit more fun with the January kit from Mosh Posh. It's funny, I was looking through all the layouts that I've done since starting scrapbooking and I think that this is the first time that I've created layouts using this much of the color yellow! I'm finding that I'm kind of liking the cheery feel of it too! 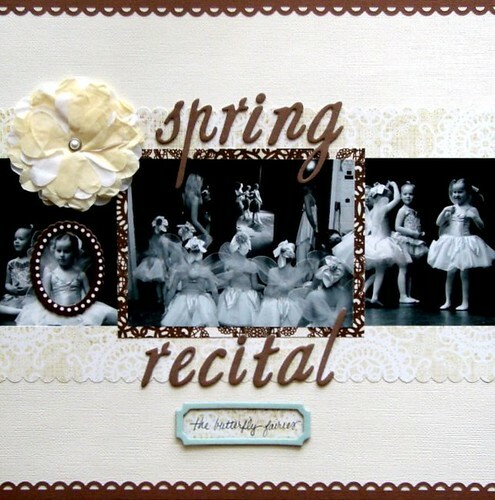 Be sure to check out the Mosh Posh blog for my blog post today sharing a 'Tuesday Technique' on clustering embellishments on your scrapbook page. The most fun you can have in your kitchen, I swear! 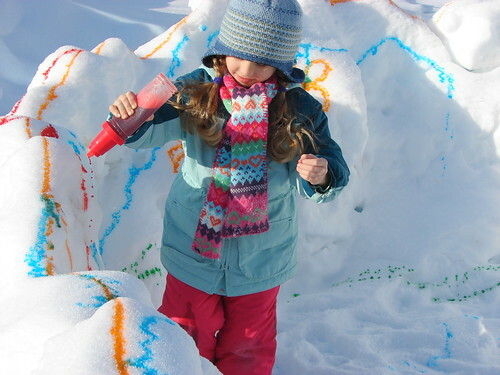 I found this fantastic idea on homemade mamas and knew that we were going to have try it out. The best part was that Zoey got to help out with pretty much every step. 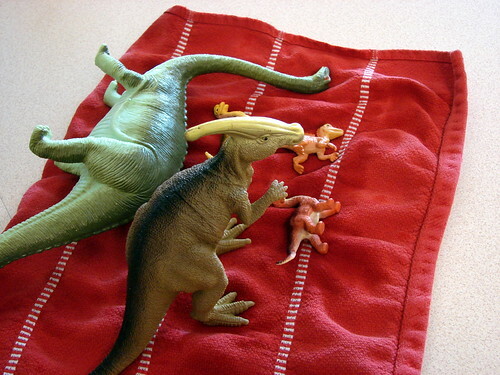 First you gather up some of your favorite dinosaurs and wash them up so they're good and clean. Zoey loved this part I think the most! 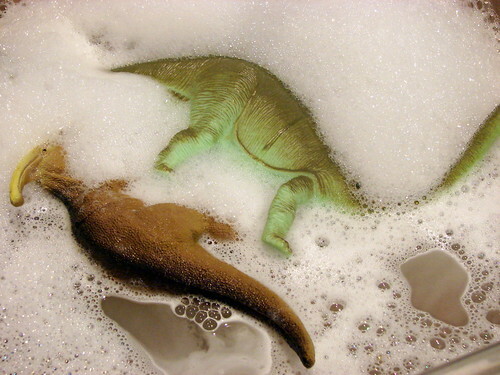 She wanted to wash up more toys after the dinosaurs were clean! Then set the dinosaurs aside to dry. 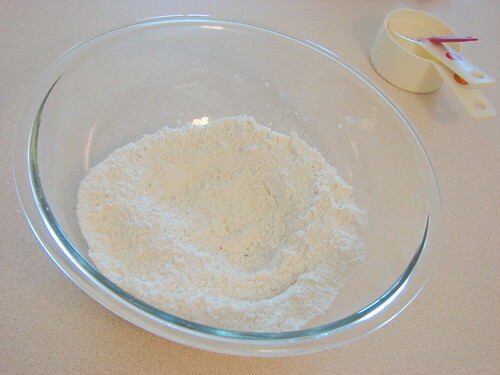 Sift together 1 1/4 C flour and 3 Tablespoons sugar and then mix in 1/2 C butter. Dough will be crumbly but work it until it's solid kneading some on the counter if needed. 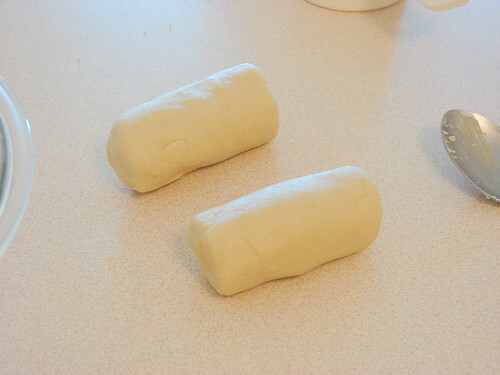 Roll dough into 2 inch rolls and slice dough in 1/2 inch slices. 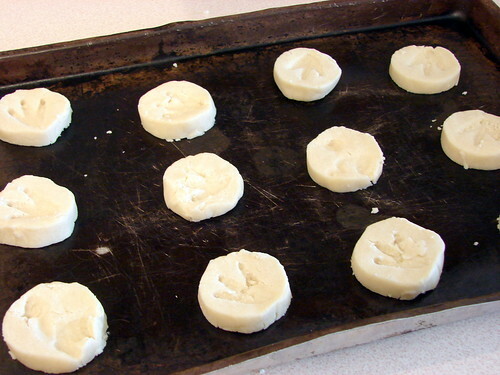 Place cookie rounds on un-greased cookie sheet. Make your dinosaur impressions using the feet, or body parts of your dinos! It's okay if they look a little crumbly! Bake in a pre-heated oven at 325 degrees for 25 minutes or until the bottoms are slightly browned! 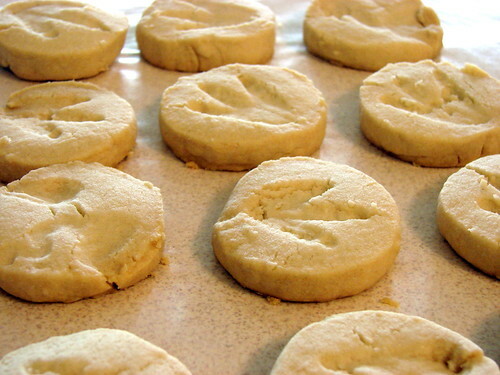 This recipe made up about 16 fossils (I mean cookies!). Note - I followed the recipe that was on Homemade Mamas and in the future I think I'll use this one from Betty Crocker just because it's a bit sweeter and dipping the bottoms in chocolate would be fun too! 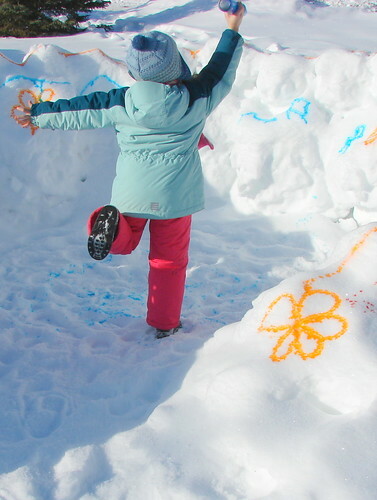 had some fun yesterday playing in the snow with Zoey and last night we stayed up and watched 'The Incredibles' and snacked on some yummy buttered popcorn (which Zoey declared was better than theatre popcorn...she also said that this spring she wants to plant some popcorn seeds so that she can eat popcorn whenever she wants this summer, will have to make a note to talk to her a bit further about that). It was really a fun way to end the day and Zoey loved getting to stay up late (without it even being a holiday!). 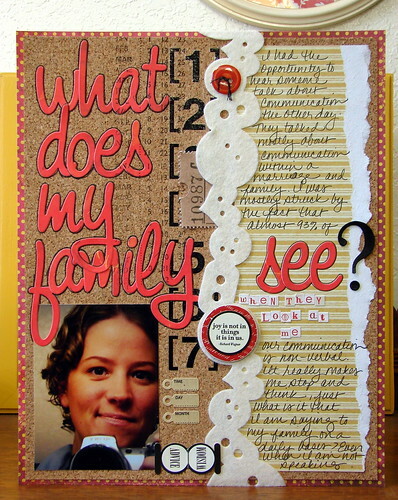 After the movie (and she was tucked away and snoozing) I whipped up this layout using my January kit from Cocoa Daisy. After creating it I realized that I kept the design pretty close to that of my other dance layout that I recently did but that's alright...it works! And if it's not broke, than don't fix it right? 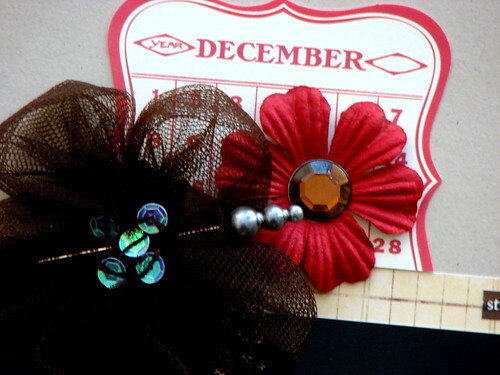 Isn't that tulle flower by LilyBee just precious? 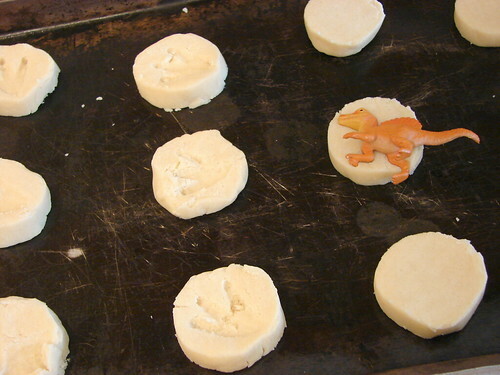 Today we are hopefully going to be baking some Fossil cookies and if they turn out, I'll share the fun recipe! 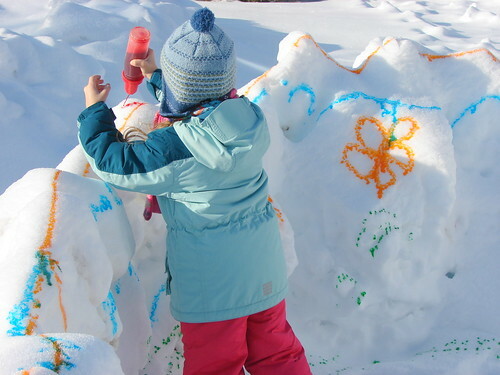 Zoey got some snow paint from her Auntie 'Rena this year for Christmas and today the sun was shining and it wasn't bitter cold outside or windy, so we tested it out. Verdict? She loves it! Just hoping now that the neighbors do too! 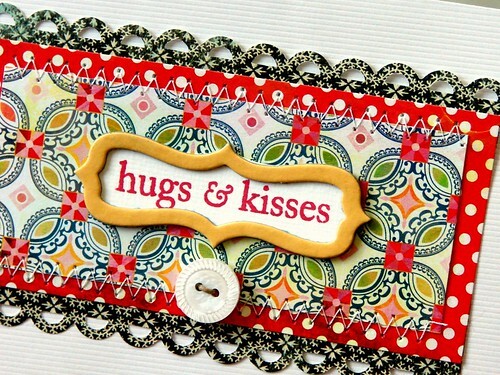 I had a gift certificate that I won from Two Peas in a Bucket for participating in some challenges over on the message board to use up and I opted to use them on some new Valentine's Day stamp sets, specifically, these and these by Hero Arts. I've been wanting to play with them ever since they arrived at my doorstep and finally got to do so the other night. I used Jennifer McGuire's idea of cutting a standard A2 sized cards in half and am loving the little size. 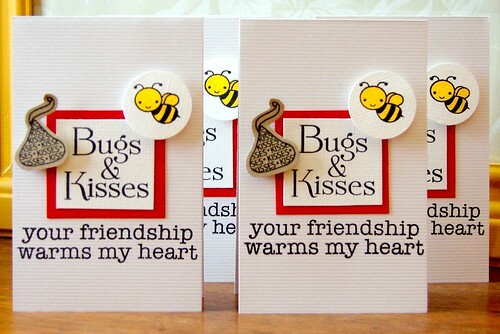 These will be perfect for Zoey's little Valentines for her special buddies at school! Can't wait to make some more and change them up a bit by using the additional images from the stamp set's! she loves me "anyway." It didn't phase her one bit that the plan was to bake a pretty, pink strawberry frosted, double-layer cake for a special un-birthday party day (we sometimes have those) only to have it turn out..in pieces. It didn't even make her flinch. I remember wanting to throw it out and she wanted to frost it. 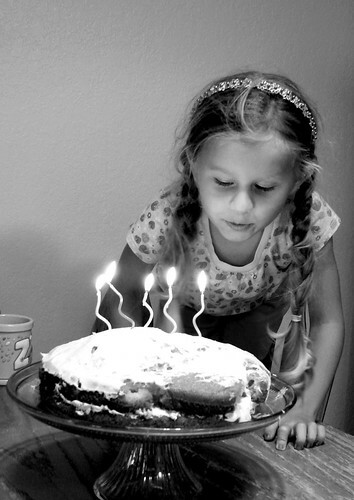 She said, "Come on Mom, it will still taste good and we can still put candles in it!" as if that was the very best part. This photo is from late last summer and while looking through my photos today on my computer I stumbled upon it and it hit me that right now she is loving me full force, completely...with no judgment's and no if's, and's or but's...she is in my court and in my corner. And then I had the thought that it might not always be like that. Feel like this. I love her so much and hope against all hope that she will always feel even just a little bit this way. That she'll love me "anyway" and despite all the future cake's that don't turn out or the day's that don't go just quite as they were planned. 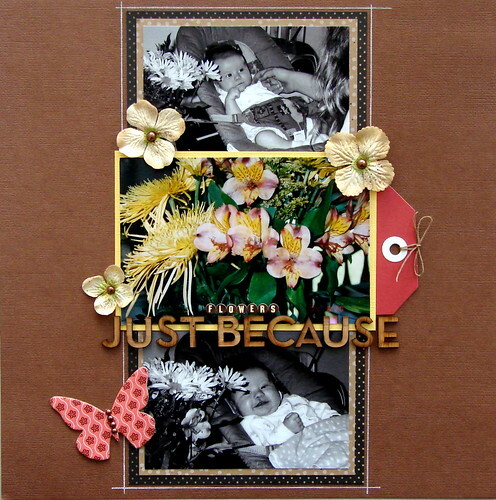 Just thought I'd quick share my layouts that I did using the delightful Pocketful of Posies kit for Mosh Posh this month! A super sweet kit, really had some fun with these layouts! Check out the kit and add-ons here! I've still got the Maya Road Triangle Banner Album and lots more from the kit and am hoping to have some time to work on that at some point (if I get my CI projects for CHA done that is!). Here's a somewhat recent layout that I created just for fun...I had been thinking about a guest speaker that was at one of our more recent MOP's meetings whose message really resonated with me. The speaker is an area pastor of a congregation in our community and he was speaking about communication and how only 7% of all our communication is verbal and the rest is all non-verbal. Which means...we are saying alot even when we may not think we are. Mostly, to our loved ones and those that we spend the most of our time around. It made me think about how it is that I greet Zoey at the end of a school day or whether or not I make the effort to meet Ethan at the door when he comes home late and exhausted from work. Do I smile and take a moment to check in and see how his day was, or since I'm exhausted and done in from the day too, do I just keep on making dinner and not acknowledge that he's home in a direct and pointed way? This topic really struck me for some reason and made me think about myself and how it is that I potentially affect those around me (as well as how it is that I am affected by others) and as for myself, I'm trying to make more of a concious effort to pay attention to what it is that I am saying when I may think that I'm not even speaking at all. 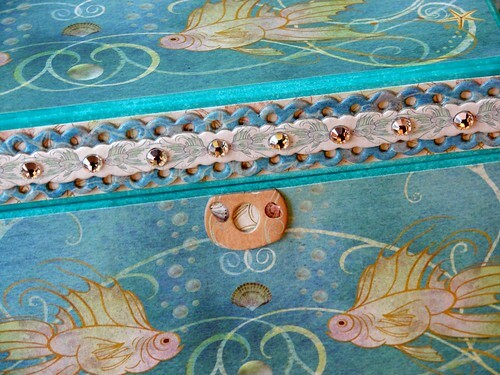 Wanted to share this BEAUTIFUL new collection with you from Teri Martin's new line, Sand and Sea. It will be released in it's entirety at the Craft and Hobby Show later this month in California but here is a little sneak of a project that I created using it. To check out the entire collection be sure to check out the Creative Imaginations blog. Remember, there is an amazing opportunity to become a CI guest designer too...check out that info here. Another little something fun that I used on the Bare Elements Photo Box was some Luminarte Misting Spray...that's a little something fun that Creative Imaginations has up it's sleeve as well. =) And I have to say, it's making me one very happy girl! Keep on checking the Creative Imaginations blog...they're sneaking peeks every day of the new collections and even sharing some exciting news regarding new designers! but I have to say that I am really, really, really wanting these! I'm buried in working on my CHA projects right about now so am feeling a bit silly perhaps? Happy Sunday everyone! I finished up this little pocket/tag book today that will be an upcoming class that will be held at Paper Studio in February. Pretty basic all around and I repeated the design from my Christmas book and kept it pretty simple. I thought it could make for a nice little home for little love notes, coupons, favorite quotes, or photos. 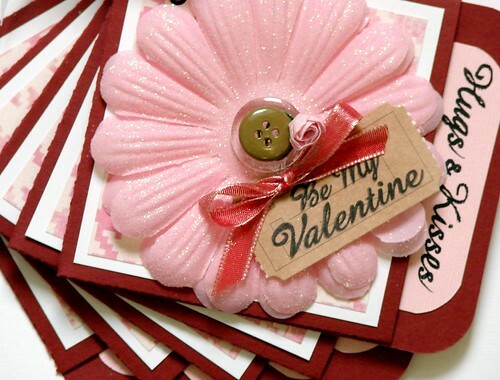 You could even insert little gift cards for coffee, latte's or special treats into the pockets for your loved one. I'll be sure to share the dates that the class will be offered here once I know them!